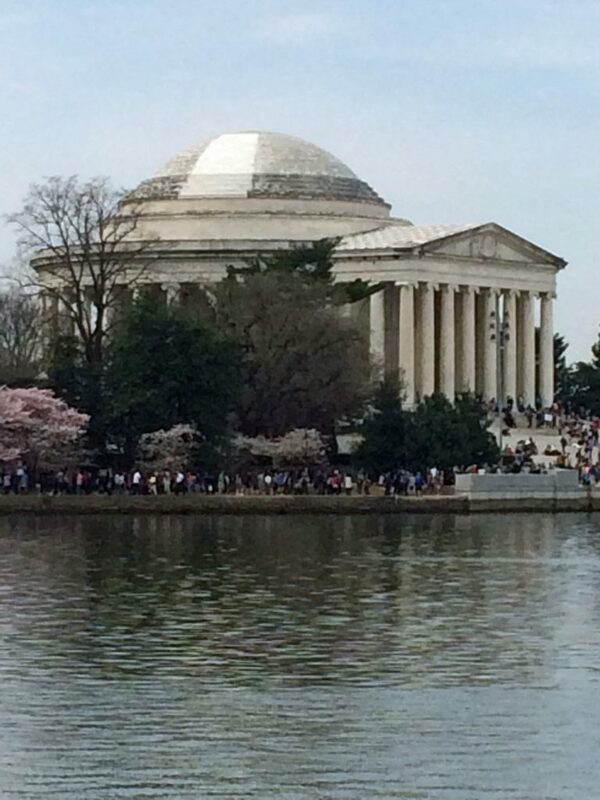 Notice the white stripe on the Jefferson Memorial’s dome? It’s just the start. The U.S. Park Service awarded an $8.75 million contract to clean the marble of a biofilm, repair stone and replace the roof by May 2020. Meanwhile, the memorial to the nation’s third president will remain open to the public. The white stripe came from a laser test to remove the black biofilm comprised of algae and bacteria that resembles dirt. Removal through chemicals was thought to damage the marble so lasers to burn it off were tested several years ago. Now, the park service has funding to complete the job on the 1944 memorial. This entry was posted in Memorials and tagged Best Washington DC walking tours, cleaning Jefferson Memorial, Jefferson Memorial, Photo by Lisa Snider, what is the white strip on Jefferson Memorial. Bookmark the permalink.